Ah, Spring…the time of the year when the snow starts to melt and rain begins to fall from the sky. No matter where you are at (with some exceptions — I am looking at you Arizona! ), Spring typically means copious amounts of mud and rain on the trails. Despite this annual occurrence, it has always surprised me that there isn’t a wider selection of waterproof trail running shoes on the market. Sure, there are a few, but a majority of waterproof gear comes in the form of a hiking boot and other clunky footwear. Well, that is no longer the case. Just in time for the wet weather of 2016, Topo Athletic released their waterproof shoe, the HydroVenture. As a member of the Topo team, naturally I was going to try it out…so I did and now I want to share my thoughts. DISCLAIMER: I am a member of the 2016 Topo athlete team and this pair of HydroVentures was provided to me for free. However, my goal with every product review is to provide an unbiased review so that you can make informed decisions and I can help the company improve on their product. A wide toe box allowing for freedom of movement and natural splay of the toes. A narrower mid foot and heel that provides a more snug fit throughout in order to provide a secure feeling without slippage. A low heel drop to promote natural foot motion. In addition, the HydroVenture incorporates some additional features to round out the shoe and make it the lightest waterproof trail shoe on the market. A partnership with eVent incorporates a waterproof membrane that keeps water out without sacrificing breathability. A rockplate to promote underfoot protection in the front of the foot. The HydroVenture uses the same outsole lug pattern as the MT-2 and the RunVenture. After using both of these shoes extensively over the past year, I say if it isn’t broke then don’t fix it. The outsole has proven to be an extremely durable, multi-purpose choice for all types of terrain. The stack height, ride, and responsiveness are all very similar to the MT-2. In other words, it is a mid-cushion shoe that provides ample protection underfoot without sacrificing too much responsiveness. The upper is similar in appearance to other Topo trail shoes, but adds the eVent waterproof membrane. The special thing about this membrane is it gives you true waterproofing without a significant addition to the weight or without sacrificing breathability. In fact, the HydroVenture weighs only about a half ounce more than the MT-2. As far as fit, I did notice a slight difference here. Whereas the upper on the MT-2 seems to have a little bit of stretch, the HydroVenture, likely because of the waterproofing, didn’t have as much give. As a result, the shoe felt just a slight bit tighter in the upper mid foot. I accommodated this by loosening the laces a little bit, which seemed to do the trick. Another option for some may be to go up a half size. The shoe comes in at 9.7 oz for a Men’s 9, which is middle of the pack for a mid-cushion trail shoe. I personally did not see this as an issue as the shoe still felt pretty light and responsive. Also, considering the trade-offs, dry feet are more important on some runs than a little bit of (barely noticeable) added weight. 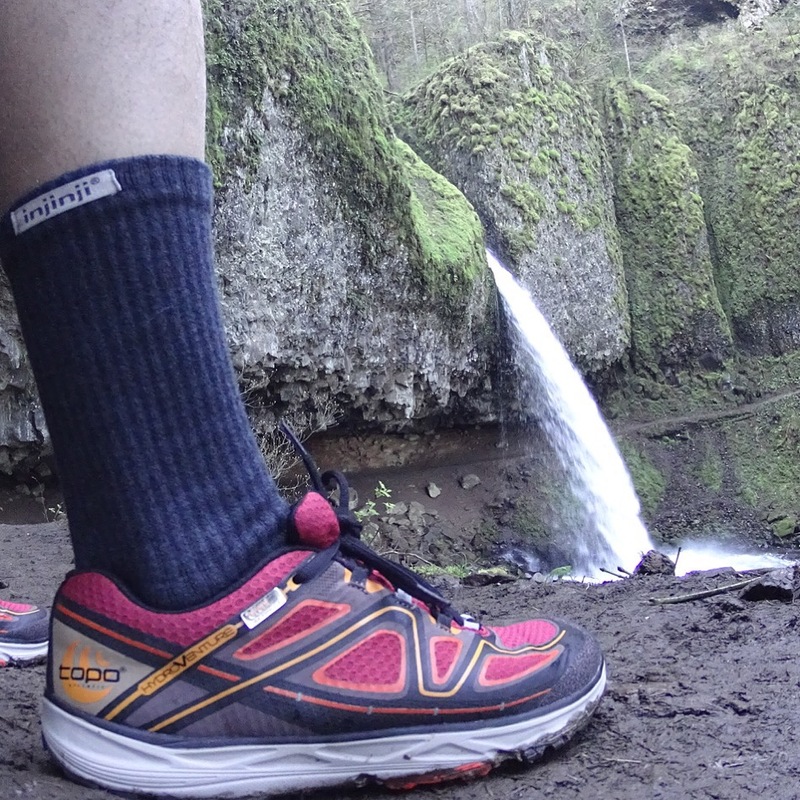 My longest run in the HydroVenture was the 50 race miles on wet, rocky terrain through the Columbia River Gorge. During this run, I felt the shoe had more than enough cushion. Even on the pavement sections, they provided a smooth, comfortable ride. As is typical with Topo, my toes had plenty of room to move freely. What is even more important is that I experienced no blisters or hotspots thanks to the secure fit. Lightest waterproof trail shoe on the market! Topo design more closely aligns with my foot shape and the natural mechanics of humans. The upper is a bit more restrictive than their other shoes. You will want to loosen the laces or size up a half size. Speaking of the laces, they were a bit short. Double-knotting them was a bit iffy in a standard lacing configuration. If this review wasn’t incentive enough to try the HydroVentures, how about a 10% off code at TopoAthletic.com. Just use TOPODEANJ10. If you like this post and would like to stay up to date when future gear reviews, race reports, and other related posts are released, please follow my Facebook page at Ultrarunner Joe! This entry was posted in Gear Reviews, Product Spotlight, Shoe Reviews, trail running, ultra running and tagged footwear, gear review, HydroVenture, product review, running, shoes, topo athletic, trail running, UltrarunnerJoe, ultrarunning by Ultrarunner Joe. Bookmark the permalink. Nice review! I’ve been meaning to try out a pair of Topos. I really like the design of their shoes. Hi Joe! Great review! Can you speak to how fast they dry out? I am looking to move into trail runners for long distance hiking. I love the MT-2 but they do not come with the rock plate so looking to move into the Hydroventure (Runventure isn’t substantial enough of a shoe for me.) Thanks! Tough question. The only way for the shoe to get wet is if you go through water deep enough to enter the inside of the shoe around the ankle. With the rest of the shoe, water just beads off so it doesn’t actually stay wet at all. Assuming water did enter inside the shoe, it is nearly as breathable as the MT-2, so I think it would dry out in similar time if not just a tad slower, but I haven’t had that happen yet. Thanks so much! I think I am going to go with it and the code is a super plus!! I just bought a pair of these shoes in NC. I went for a 7 mile trail run last night in them. It was 85F and 95% humidity so all the sweat poured down my body and filled up the shoes. The water proofing does indeed work in reverse and I had a very squelchy wet footed, run. All that water in my shoes also made them heavy and caused my feet to slip around inside the shoes. I’d say these aren’t the best shoes to wear in summertime for that reason. Which is too bad because this is also thunderstorm season and the trails are wet and muddy. Woah, that’s a lot of sweating! The case with all waterproof shoes, it typically works both ways. Sorry to hear…honestly never had this kind of encounter. Ha! Yeah I’m a big guy and a heavy sweater. 6’2″ 220lbs. I’ve lost up to 9lbs on a long run down here while drinking 3 liters from my camelbak. I should say though that I do like the shoes, they’re just not great summertime shoes for me. At least not in NC. Joe, I’ve been following your reviews of Topo shoes and it’s the first place I’d look for new Topo shoes. Wanted to asked if you have tried the Topo Terraventure yet? Any first impressions? Are they closer to Ultrafly or Magnifly in terms if cushioning? Thanks and keep those great reviews coming! Unfortunately, I haven’t gotten my pair yet…next couple weeks hopefully! Spec wise, the stack height is 2 mm more than the MT-2, with 1.5 of that in the more rugged outsole and 0.5 in the inside of the shoe, most likely due to the rock plate (which the MT-2 lacks). As someone that runs in the rocky West, I am super pumped about it and will keep you all posted. Joe, thanks for the insights in the specs! I’ll be eagerly awaiting your review! Meanwhile, I’m loving the Ulrafly in navy blue! Super cushy and smooth heel to toe transition! Hey Joe. Have enjoyed my runventures all summer/fall thanks to your recommendation and wanted to get the MT-2 for a bit more cushioning this winter. Unfortunately, Topo is out of my size in the MT-2. They do have the terraventure…..hope you get your pair to try soon, I will be awaiting your review! Thanks. They told us that they have an inventory restock coming in the next week or two, so keep an eye out. As far as the Terraventures, I have a pair in transit, so stay tuned! Thanks, Joe. Good to know about the MT-2 — and still looking forward to getting your take on the Terraventures!